We collectively celebrate the Chinese New Year on 23 January 2012: The Year of the Dragon/Water Year. The Chinese Zodiac can lend anyone insight into their personality and natural tendencies, like our Western Zodiac can provide. Our friends in the West take their Zodiac and divide it into 12 signs as does Western Astrology, yet one animal sign influences an entire year verses one month.The intricate link in understanding the common ground of these two systems is the transits of Jupiter, which take approximately one year to transit through one Zodiac sign in the West. Here in the West it only takes that same years’ time to represent all 12 signs on our Zodiac wheel, while our friends in the East take 60 years to complete a full cycle, as each animal every 12 years is depicted through 5 different elemental years of earth, metal, water, wood, and fire. Thinking big and promoting optimism will be rewarded in 2012, as the collective can expect this to be a time of dramatic flare, spectacular events, and an auspicious year to begin anything anew within. The energy of being bold and daring is favored to stimulate fortunate outcomes in new adventures of any kind, from business to marriage. The most outlandish, eccentric, original and different ideas will be rewarded as the months within 2012 unfold. Now the collective experiences the 5th year within a 9 and 12-year cycle, where the seeds planted in 2008 are seeing some true blossoming and complete currents of change to eventually reap a harvest, just a couple more years further down the road. With Mercury guiding the singular 5’s energy over 2012, there is plenty of movement, risk-taking, versatility and communication to be found amongst the Dragons’ urges for the magnificent. 2012 marks the time where never seen before ideas will bring the masses together in a more unified understanding of who we are as part of the wholeness of humanity. Grasping some true Lexigram wisdom when embracing the MAGNIFICENT plays a important role in what 2012 can hold for anyone, as we poetically phrase the anagrams we can derive from it. What joy can be found when I AM IN A FINE MAGIC GAIN IN A MAIN TIME TEAM. Or realizing I AM A ENIGMA MAGNET, INFECTING AN INFINITE ENTICING AGE. If we are to adapt smoothly to what exciting and irresistible energy the Dragon is here to share with us -especially within the added intuition of the Water Year- we are best to hone in upon our own sense of psychic ability when it comes to quick change within our lives to find our necessary answers. All is set to come alive in our outside world and community life in a Water Dragon Year as we allow our diplomacy, compassion and idealism to tackle social situations requiring resolve. The Dragon asks that we awaken a visionary, intelligent and scrupulous instinct within ourselves. Once more under the Water influenced year, being the eye of any apparent storm is key to knowing how to handle a Dragon’s natural excessive energies. With the Dragon representing Yang Wood energy, what transpires over the year ahead brings forth profound success or failure, depending upon the genuine intention behind initiations. 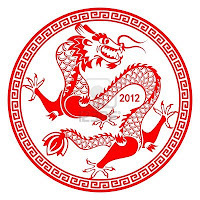 The Dragon is the only Chinese animal that is from myth upon their Zodiac Wheel. However, they firmly believe that this symbol is the most powerful of all, and when one is born in a Dragon year, there is much fortune, money and luck to be found all along the life. Even in the midst of mistakes along the way, Dragons are well known to always still come out of the most pressing situations still smiling. So chin up to any 2012 gloom and doomers: while it is best to be prepared for adventurous change, wearing a SMILE will most certainly go for MILES in this Dragon Year ahead. When you see an enthusiastic, successful, persuasive and strong spirit that eagerly shows that life is to be savored by living every day as if it where your very last. IS frank, at times demanding, enjoys starting things they may not always finish, makes their home wherever they are, excels at problem solving, exudes self-confidence, prefers to take it as it comes verses a routine, possesses an innate sincerity, dislikes waiting for anything, avoids feeling dissatisfied and discontented. The external masculine represents the leading role and gravitates to activity, sociability, passion and efficiency. The symbol of wood allows for an ambivalent and dual nature to emerge. The energy of the Dragon can become unbalanced when strong emotions overtake them- turning kindness to anger, and their natural exuberance to vulnerability. The Dragon’s energy marks a universal time for renewal and growth within what already exists. Dreams are motivated to become reality for any new venture from a business to marriage, and seemingly, the more outlandish it may be, the greater outcome for success it will have. 1904, 1916, 1928, 1940, 1952, 1964, 1976, 1988, 2000, all saw large-scale changes within these areas on a global level, as will 2012, as along as intuition is carefully listened to with the Water energy guiding this particular year. As the months ahead pass, look for financial situations to stabilize and find simpler, grounding means to display true value through mid-year as Jupiter finishes up in Taurus. Once Jupiter enters Gemini, get ready for an explosion in the communication industries, optimism to return to the publishing world, education, fashion, the performing arts, and prosperity to ignite moral ideas that continue to truly evolve humanity. *The Chinese New Year is always celebrated upon an Aquarian New Moon here in the West. *Legend has it how the Chinese Zodiac Wheel order formed is that the Rat hitched a ride on the Ox who didn’t originally intend to become the second animal in line, when Buddha challenged the animals to a race to win a position on the Chinese Zodiac calendar. The least competitive of all the animals (the dog enjoyed a bath along the way, while the pig decided to make sure he was full and even napped) fell into place to complete the 12 Animal Wheel. *At the ages of 12, 24, 36, 48, 60, 82, 94, 106, typically one experiences a very positive year as their animal returns. Coinciding with West’s planet of luck, Jupiter, returns to its’ natal point also every 12 yrs. *At 60, the Chinese believe one’s greatest wisdom begins to unfold as one full cycle of their wheel concludes. Simultaneously in the West, the 2nd Saturn Return, in agreement with this passage also marks the soul being released into the finest period of self -expression and inner power after learning our most important life’s lessons over the previous 59. CATCH the PODCAST from 17 JANUARY! What’s Your Sign? I Have Your Number? Special Guest Astrologer Chris Flisher and Sharita dived into a hearty discussion of East meets West, and what both Zodiac perspectives indicate is to unfold as 2012 continues.